본 연구는 2012년 2월 6일 국무총리 주관으로 발표된 ``학교폭력근절 종합대책``으로 학교폭력 가해학생 조치를 학교생활기록부에 기재하는 방안에 대해 법적인 쟁점을 분석하는 것을 목적으로 하고 있다. 현재 경기도 교육감이 교육과학기술부 장관을 대상으로 가해학생 조치의 학교생활기록부 기록을 강제하는 것은 법적 근거가 부족하며 학생의 기본권을 과도하게 침해하므로 위법이라는 취지로 대법원에 소를 제기한 상태이다. 먼저 학교폭력 사안의 학교생활기록부 기재의 근거인 「학교생활기록 작성 및 관리지 침」(교육과학기술부 훈령)의 법규성 여부를 살펴보고, 학교생활기록부의 성격이 교육감 의 자치사무인지 중앙행정청으로부터 위임받은 사무인지를 논의하였다. 마지막으로, 가해학생에 대한 조치를 학교생활기록부에 기재하는 것이 가해학생 기본권 침해의 제한원 칙인 과잉금지원칙에 위배되었는지를 분석하였다. 학교폭력 가해학생 조치의 학교생활기록부 기재는「초·중등교육법」과 교육과학기술 부령인「학교생활기록 작성 및 관리 규칙」에 의해 위임받은 훈령을 근거로 한 것으로 상위법령의 위임의 한계를 벗어나지 않은 합법적인 행정행위로 판단된다. 또한 비록 지 방자치의 실질적 시행과 교육의 자율화가 진행됨으로써 많은 부분이 지방자치단체(교육 감)의 자치사무로 인식될 수 있으나, 학교생활기록부 기재는 국가가 위임한 위임사무로 분석된다. 마지막으로, 가해학생 조치의 학교생활기록부 기재를 목적의 정당성, 수단의 적합성, 피해의 최소성 및 법익의 균형성 측면에서 판단해 볼 때 비록 가해학생의 학교 폭력 행위에 대한 조치를 학교생활기록부에 기록하는 것이 가해학생의 기본권을 제한하지만 달성해야 할 공익과 비추어볼 때 그 정당성이 인정된다고 분석하였다. The purpose of this study is to analyze legal issues of filing out the school violence on student`s cumulative records based on "A Comprehensive Plan for Eradicating School Violence" in Feb.6th. 2012. In present, the superintendent of education in Gyeonggi-do sued Ministry of Education in Korea by urging that filing out the school violence on student`s cumulative records is not legitimate because it is not based on law and is violating basic human rights of bullies. 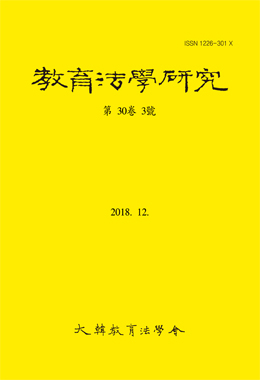 In this study, we analyzed whether drawing guideline for filing out the school violence on student`s cumulative records has legal character and examined thecharacteristics of filing out the school violence on student`s cumulative records in terms of local autonomy. Then, we investigated whether filing out the school violence violated the principle of the prohibition of excessive restriction. As a result of analysis, we concluded that filing out the school violence on student`s cumulative records is legitimate because applicable provisions are legally authorized by law and administrative rule. Also, though due to the localization and liberalization, many parts of educational issues are regarded as local issues, still filing out the school violence on student`s cumulative records is a work which is delegated by central government. Finally, when examining filing out the school violence on student`s cumulative records in terms of justification of purpose, appropriateness of instrument, and balance of benefit of the law, filing out the school violence on student`s cumulative records seems to be justified because of balance of legal interests.